Narges Nematollahi holds the Elahé Omidyar Mir-Djalali Assistant Professor of Persian Language in the School of Middle Eastern and North African Studies. She is a Ph.D. candidate in the departments of Central Eurasian Studies and Linguistics at Indiana University, Bloomington. She holds a Master’s degree in Ancient Languages and Cultures from Tehran University, Iran and a Master’s degree in Religion Studies focused on Zoroastrianism, from the School of Oriental and African Studies, University of London, UK. 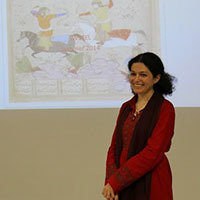 Her research is focused on the epistolary tradition in pre-Islamic Iran, composed in Aramaic, Parthian and Middle Persian languages, and how it is transformed in the early medieval Iran, under the influence of Arabic. Her broader areas of research are stylistics of Old-, Middle- and Modern Persian, historical linguistics and formal linguistics of Iranian languages.